Programmable system with superior temperature control for performing FISH/ISH hybridization protocols on 1 to 12 slides. Uses rapid Peltier heating and cooling to process FFPE, bone marrow, cell lines and other samples with FISH probes from Abbott, Agilent, Cymogen and Cytocell. Accurately detects slide temperatures using SlideSense technology for more reproducible results. Records a time/temperature datalog to USB. Removable slide trays reduce handling from assay setup through hybridization. 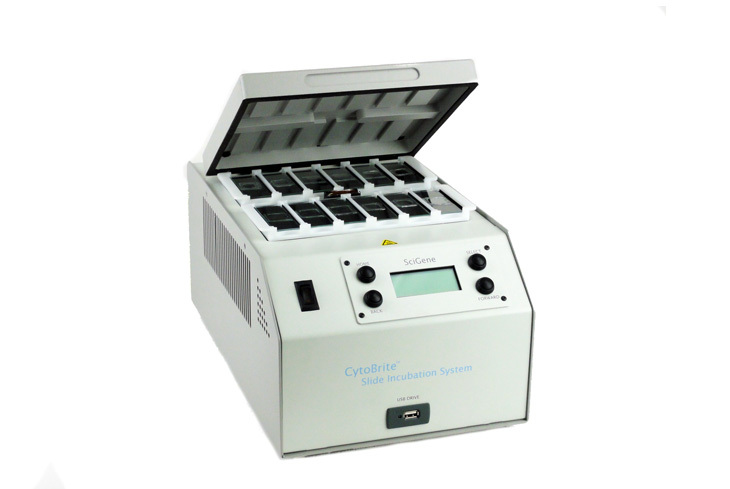 Slide trays can be transferred to a 60-slide capacity CytoBrite Slide Oven for extended or overnight probe denaturation. Requires the use of CytoBond Removable Coverslip Sealant to temporarily seal coverslips to slides, providing an evaporative seal over prolonged incubations and high temperatures without humidification.